King Bed with drawers for storage, nightstand and headboard. 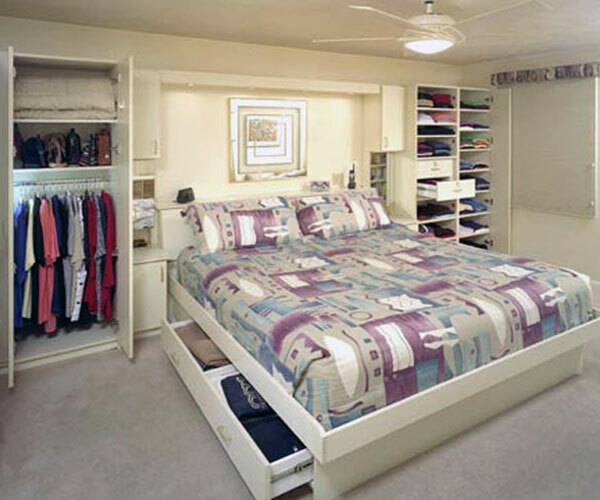 A Bed with Storage Drawers will maximize under utilized space in your room while providing great storage room. A bed of any size can be made as a be with storage drawers. These drawers can be divided into compartments to keep your things more organized. Gone are the days that there were wardrobes and suitcase / boxes under the bed. But are you sure that you have the best closet, or better said best bedroom closet? 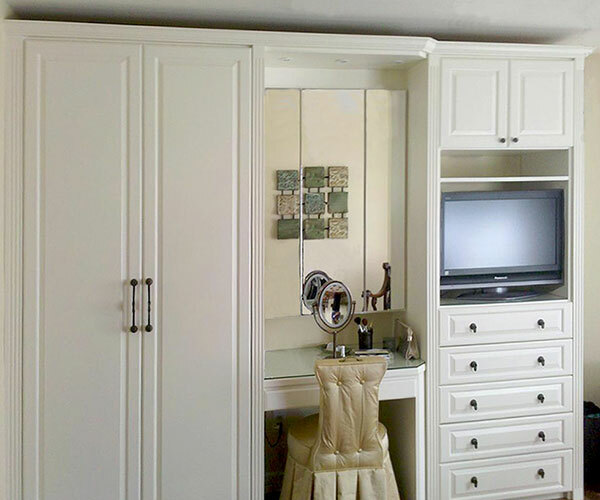 Yes, it is easy to waste good bedroom space to complex closets or closet hallway. On the other hand, there are many bedrooms with blind corners which would have been better off if they put that corner inside the bedroom closet. The same is true about bedroom closet organizers, these bedroom closet organizers should be well thought of and a good match for its user. King Bed with large headboard which acts like a storage area. Drawers under the bed for easy storage. Matching night stand, light soffit, and wardrobe system complements the King Bed. 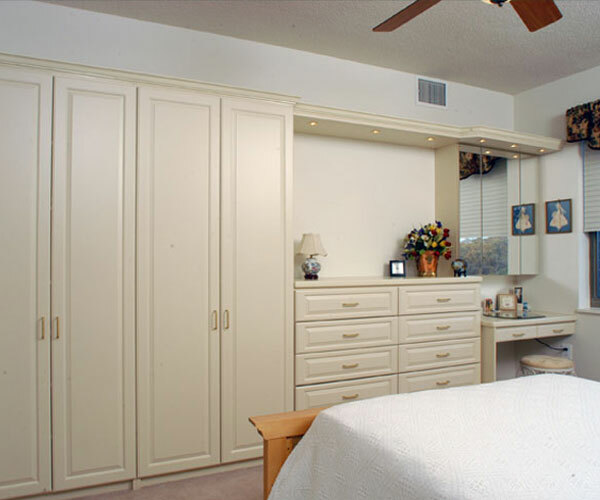 Get custom made Furniture for Bedroom or choose from a vast selection of Pre Designed Closets. 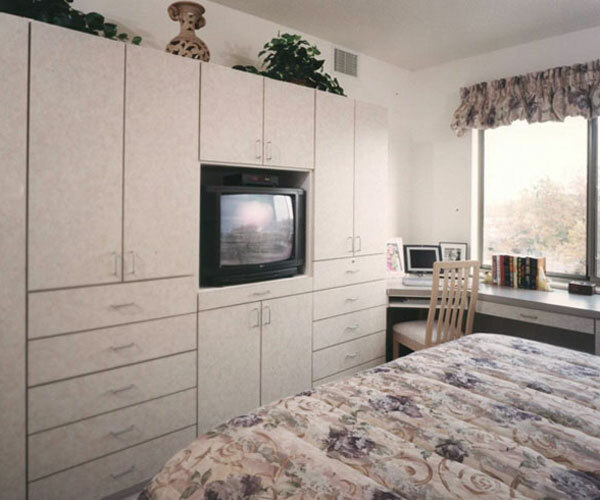 Furniture for Bedroom include TV stands, Wardrobes, and Closets with many accessories to choose from. Many colors available. Bed Drawer Storage is an extremely popular item in our vast collection of products. Under Bed Drawers provide for room for easy Bed Drawer Storage capacity. 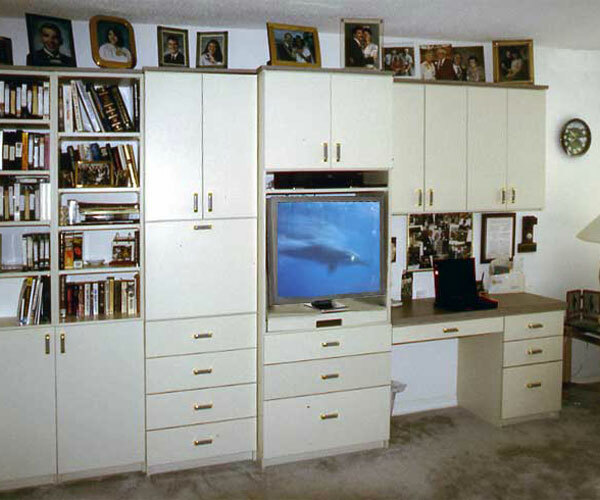 We have been making Bed Drawer Storage systems for over three decades and have many satisfied customers. Storage Bed Frames is another popular product of EDC. Storage Bed Frames accompanied with Bed Drawer Storage provide for a bed which fully utilizes space. Wardrobe Armoire with designer handles in Sunset color. Select from many different styles, colors and counter tops. 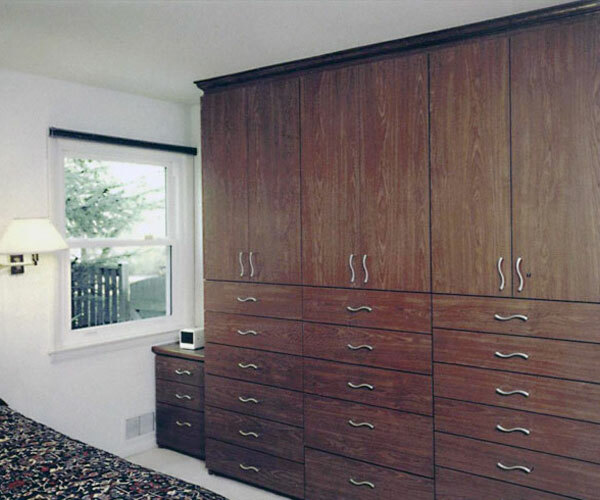 Beautiful Wardrobe System in Master Bedroom with matching drawers and designer handles. Light soffit fixed above the mirror for everyday practical use of the dresser. Crown Molding adds the finishing touches. Tall Bedroom Wardrobe system goes all the way to the ceiling utilizing all the space available. 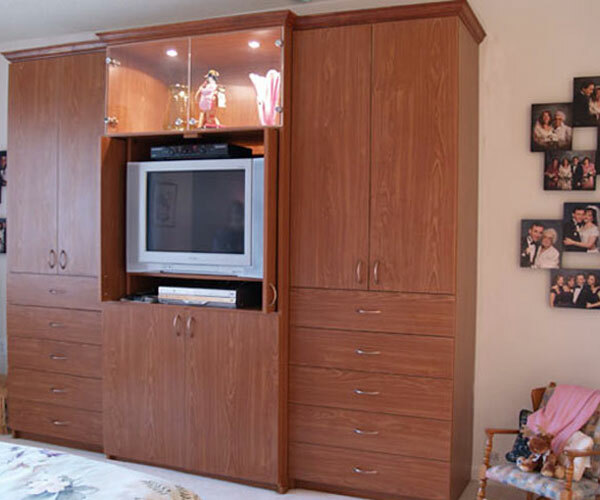 Bedroom Wardrobes come with either designer or standard handles and knobs and many other accessories. 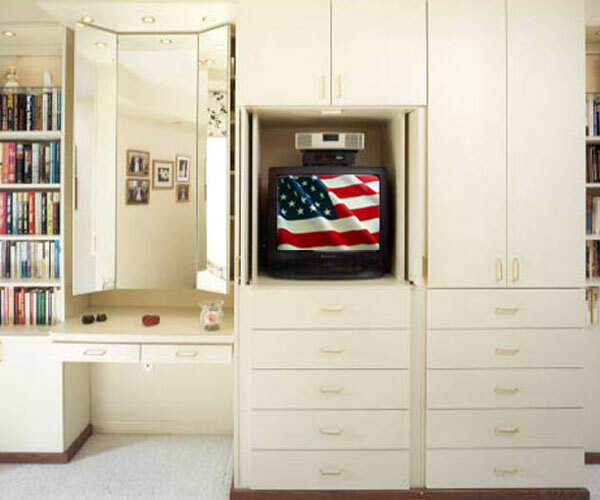 Ask about our Bedroom Wardrobes with mirror doors and jewelry inserts. 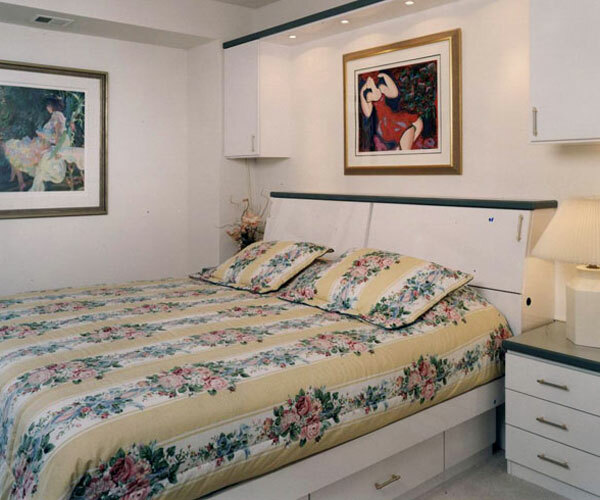 Get your Master Bed with Drawers to organize your belongings and utilized valuable space. Get your son or daughter's bed with drawers to easily store books and toys. We not only make Bed with Drawers but also make Headboard with Storage. Our Headboard with storage beds are extremely popular both with kids bedrooms and master bedrooms. Get matching nightstand drawers custom made to match your Bed with Drawers Headboard with Storage. A full storage bed frame gives ample storage room for a lot of your belongings. A full Storage Bed Frame cam be made with multiple doors so that you do not have to disturb anyone else on bed while opening your side of the storage bed frame. 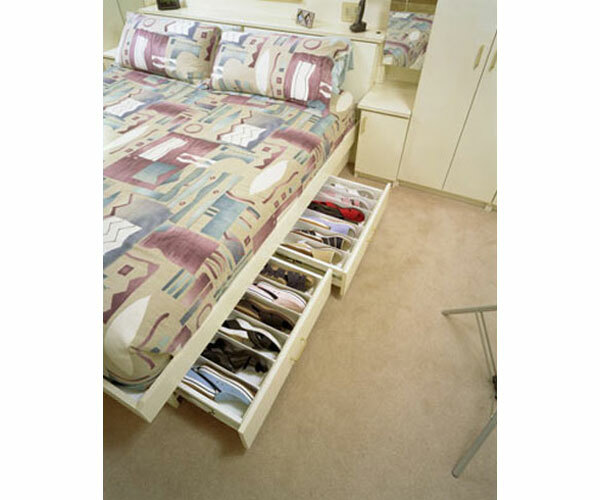 Get Storage Bed Frame with Drawers to maximize use of space. Our design experts will make the maximum use of your room space with a Storage Bed Frame with Drawers. 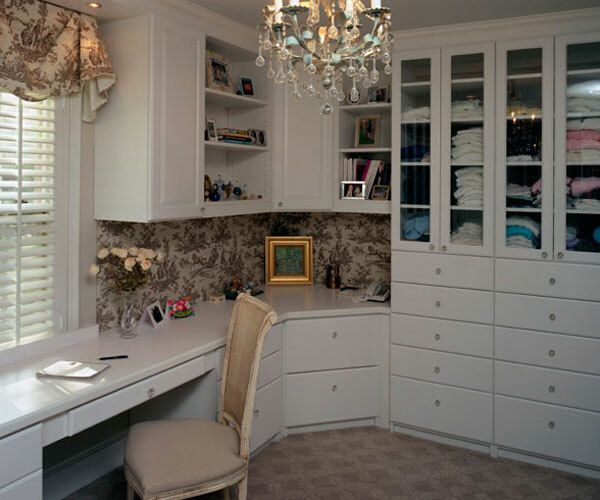 Elegant Clothing Wardrobe with overhead lights, glass doors, cloth hanging closets, and shelving units for linen. Select from a variety of colors. Modify units to your preference. 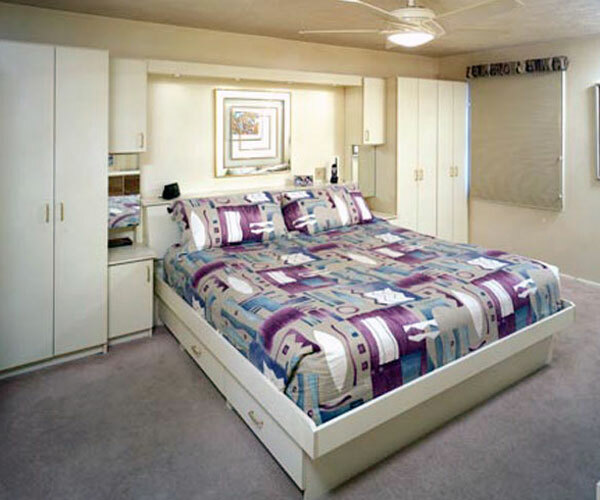 Storage Beds Full Size can have drawers organized to your individual preferences. Storage Beds do not necessary have to be full size storage beds. Kids room also can have meaningful storage beds with drawers and headboard storage. Headboard Storage is ideal in kids rooms for kids to store their toys. Headboard Storage is also extremely practical in Master bedrooms. Your son's twin storage bed will give him easy access to his toys; or your daughter's twin storage bed will allow her to get her favorite doll without leaving the comfort of her bed. A twin storage bed which has a storage headboard gives your child convenience. Of course with a storage headboard he or she will also get a lot of help with keeping the room tidy. 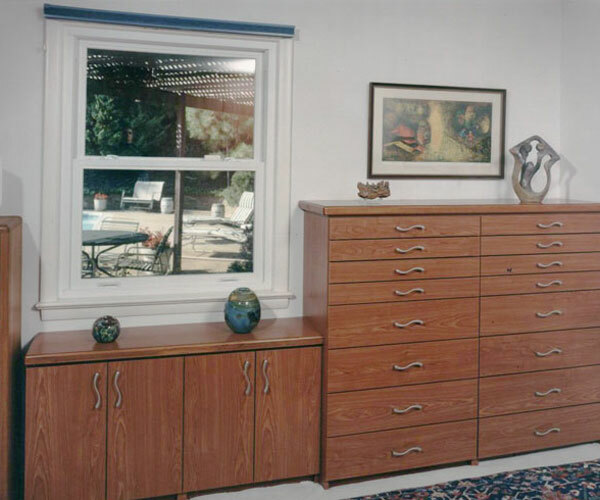 Organizer your Master Bedroom with our Storage Cabinets. Select from a variety of accessories that include jewelry inserts, double jewelry inserts, baskets, and more. 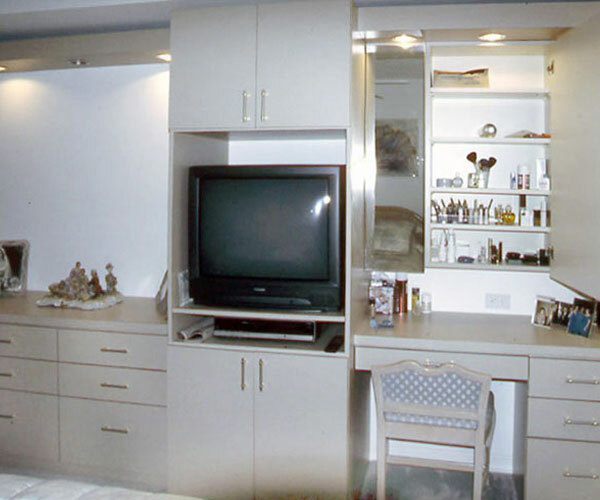 Store and organizer your clothes and valuables in storage cabinets custom designed for you. The bedroom dresser, for the most part, is the fortress of the house lady. Its chief components used to be a bedroom dresser with mirror, where the lady spends a lot of time trying to make herself more presentable. With advent of working women and two job families, the extra time of house lady vanishes, and little by little vanity tops become covered more with their belongings. 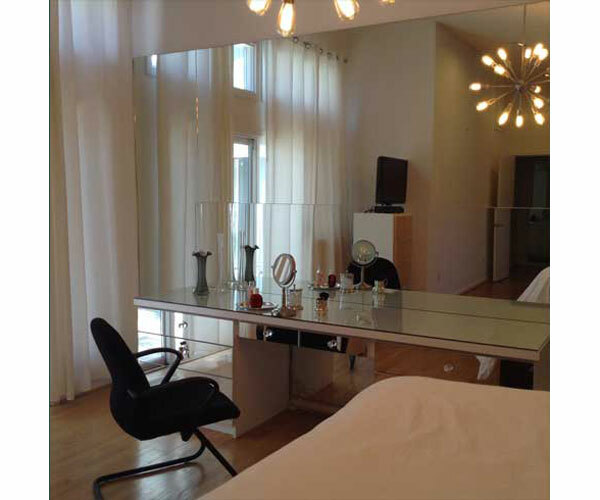 The larger mirrors, better lightning and privacy help this transition more. 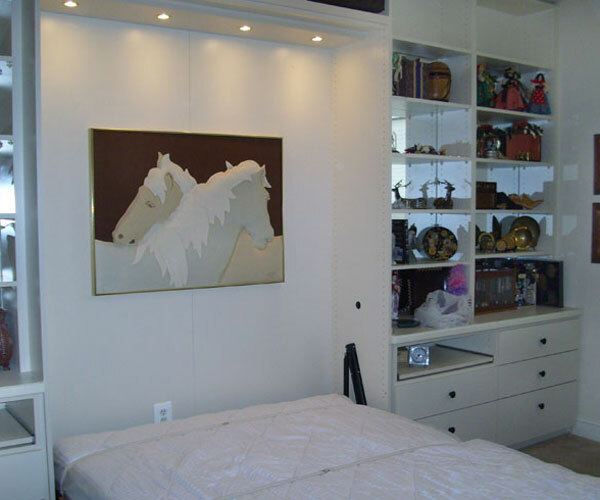 Storage King Headboard simply means that you can have storage room in the headboard of your King size bed. Do you need Storage King Headboard? Whether or not you have a lot of material to store, A storage King headboard offers you a convenient place to store you things. A storage king headboard let you reach items without leaving the comfort of your bed. Of all the furniture in the house, beds are the least efficient in using space. With tables you can put many things on top of it and use the space below it. But with the beds, you cannot use the space above at all, and using under the bed is hard. The solution is beds with drawers. Some go a little further in freeing the space with storage headboards. We design strong and elegant products that will serve you for years to come. Call us today to find out how we can help with utilizing unused space in your home. 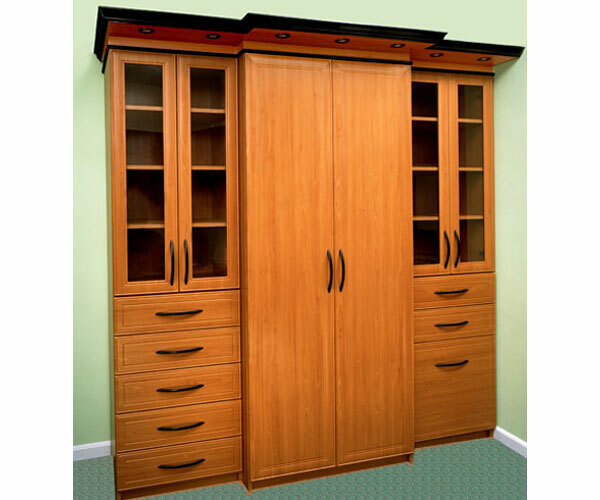 A Wardrobe system with elegant decorative glass doors and a crown molding. Our Wardrobes come in many different colors. Call today for a Free In-Home Design Consultation. 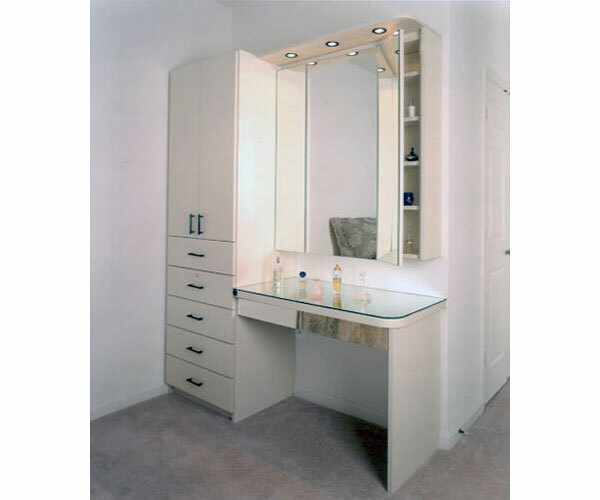 Elegant Bathroom Vanities custom made at cost effective prices. Select from many color combinations. No matter how small or large your bathroom vanity needs to be, we will be happy to serve you.